We analyze how to use the reflective approach to integrate an authorization system into a distributed object-oriented framework. 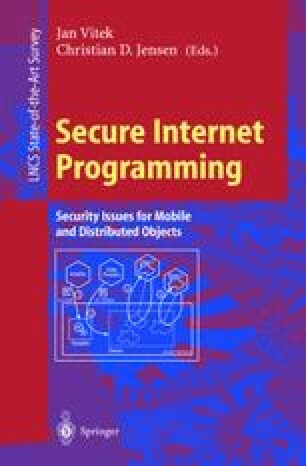 The expected benefits from the reflective approach are: more stability of the security layer (i.e., with a more limited number of hidden bugs), better software and development modularity, more reusability, and the possibility to adapt the security module with at most a few changes to other applications. Our analysis is supported by simple and illustrative examples written in Java. Massimo Ancona, Walter Cazzola, Gabriella Dodero, and Vittoria Gianuzzi. Channel Reification: a Reflective Approach to Fault-Tolerant Software Development. In OOPSLA’ 95 (poster section), page 137, Austin, Texas, USA, on 15th–19th October 1995. ACM. Available at http://www.disi.unige.it/person/CazzolaW/references.html. Walter Cazzola. Evaluation of Object-Oriented Reflective Models. In proceedings of ECOOP Workshop on Reflective Object-Oriented Programming and Systems (EWROOPS’98), in 12th European Conference on Object-Oriented Programming (ECOOP’98), Brussels, Belgium, on 20th–24th July 1998. Available at http://www.disi.unige.it/person/CazzolaW/references.html. Trent Jaeger, Nayeen Islam, Rangachari Anand, Atul Prakash, and Jochen Liedtke. Flexible Control of Downloaded Executable Content. http://www.ibm.com/Java/education/flexcontrol, 1997.